From students to families, Provo delivers on many levels. 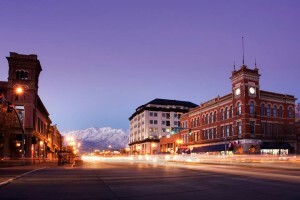 Forbes wrote that Provo was one of the best mid-sized cities in the United States for career and business due to its excellent job-growth and a low cost of business. Forbes also reviewed Provo as the third best city in the U.S to raise a family due to nonexistent crime and the low cost of living. Also, with Salt Lake City only forty-five minutes away, Provo is close enough to commute from but far enough to get away. Provo’s largest draw for out-of-staters is without a doubt Brigham Young University. BYU is the 3rd largest university in the United States and while is often known as being founded and supported by The Church of the Latter Day Saints, the university has one of the best language education programs in the U.S. with over 55 languages taught. Living on campus is not mandatory for freshmen, so those who would rather live in an apartment off-campus are lucky. BYU students are fortunate because Provo is very inexpensive compared to most college towns, so nabbing a cheap apartment for rent is going to be pretty simple. Also, since over 34,000 students attend BYU, there are tons of housing options for apartment searchers most of which are within the immediate neighborhoods of BYU. If you are looking for a place to live to accommodate more than just two or three roommates, you should probably check out the houses for rent as opposed to studio apartments or two bed/baths. BYU offers much more than just an institution for students, however. Containing several museums such as the BYU Museum of Art, Museum of People and Culture, and Museum of Paleontology, BYU offers a place for learning and observation for the entire community. Also, you cannot forget about the Cougars, BYU’s football team that has won 23 conference titles since 1922. The LaVell Edwards Stadium on campus seats 63,470! It’s no secret that Provo is home to a thriving Latter Day Saints community. There are dozens of LDS churches throughout Provo and Orem, so there is going to be a good chance that wherever you live in the area, you will be walking distance from your church. Also, Provo is home to the Missionary Training Center which is located at BYU. For those training for their mission, finding a home for rent in the neighborhood of Pleasant View will be the most convenient. Apartments with all bills paid are scattered throughout Provo as well. Those moving to Provo that enjoy the great outdoors will be happy to know that they will be surrounded with options for weekend getaways. For example, Bridal Veil Falls Park is only a fifteen minute drive from Provo and boasts a 607 foot waterfall. The park is a great place for an afternoon picnic, a swim in the Provo River or rock climbing and in the winter, ice climbing. But there is also Aspen Grove Family Camping for camping, boating and fishing which has received high ratings by Provo residents and is only a half hour away. Mt. Timpanogos is the place that you want to go for scenic hiking and for the spelunker due to its three large caves: Timpanogos Cave, Hansen Cave and Middle Cave. Pet owners will be happy to know that there are tons of pet-friendly parks and trails in Provo as well. Also, you cannot forget about the amazing ski resorts that surround Provo such as the Sundance Resort and Brighton Resort. Provo’s climate is what you would call extreme. In the summers, the temperature can reach the mid-nineties, while winter lows average in the mid-twenties. However, for the outdoor enthusiasts, having warm summers and cold winters for skiing may be a dream come true. Though apartment searchers may want to look for apartments with utilities included to save costs. Also, for the hottest days, make sure to check out Seven Peaks Resort Water Park to cool down and The Peaks Ice Rink for the cold days when you want to warm up. Although Provo is inexpensive, that does not mean there are a lack of luxury apartments. Since much of Provo’s apartment living targets BYU students, using an apartment guide will be much better for finding the finer apartments as opposed to Craigslist since you will have better control of your search. RentLingo is your trusted apartment finder in Provo. We hire local experts, such as former property managers and locators to anonymously tour and consistently rate and review every available place. They share their honest and unbiased perspective with you, so you know how every rental ranks in the area. Because our experts tour every property, we can offer consistent apartment ratings across every region. So unlike finding a Backpage or Craigslist rental, you can trust these apartments are verified and trustworthy: whether it's a cheap studio or a one bedroom with all utilities paid all the way up to a nice house for rent or a luxury condo.